Review posted March 2, 2016. McSweeney’s, San Francisco, 2015. 104 pages. 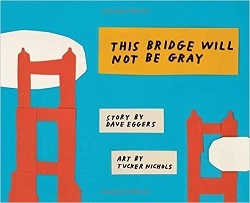 This Bridge Will Not Be Gray is a picture book about the construction of the Golden Gate Bridge. It’s a long picture book, but otherwise fits picture book format. Every spread has a cut-paper pictorial background, and no spread has more than a few paragraphs of text, if that. This isn’t the fancy, realistic-looking cut paper of Steve Jenkins. This is simple, with basic shapes. People are shown as heads of various colors (such as blue and green and red). But the simple style does work. Dave Eggers takes us through the design process of the Golden Gate bridge, beginning with the beautiful bay itself. It is interesting to me that the reason the Golden Gate Bridge ended up reddish-orange in the first place was that was the color they painted onto steel when it was shipped to make it rust-proof. They hadn’t actually decided what color to paint the bridge, but plans were to paint it gray. When Irving Morrow was on the ferry one day, he watched this orange steel being assembled, and he had a thought. He thought that this color was beautiful. And when Irving was asked what color he thought the bridge should be, he said, Why not leave it this color? And people said, What? And they said, Huh? And they said, Irving, you are nuts. No bridge had ever been orange. Who had ever heard of an orange bridge? No one had, because no bridge had ever been this color. This is true: no bridge in known human history had ever been orange. And for a good portion of the human race, because something has not already been, that is a good reason to fear it coming to be. But as the debate continued about the color of the bridge, an interesting thing happened. Other people noticed the same thing Irving had noticed: that this accidental orange somehow looked right. That gives you an idea of the conversational style of the book. The simple graphics accompany it and add up to a lovely and informative story of how one of the most beautiful bridges in the world was built. The Golden Gate Bridge, which is orange, is the best-known and best-loved bridge in the world. It is especially fitting that the author, the illustrator, and the publisher live and work near the Golden Gate Bridge.